Scientists have long been puzzled about what makes Mercury’s surface so dark. The innermost planet reflects much less sunlight than the Moon, a body on which surface darkness is controlled by the abundance of iron-rich minerals. These are known to be rare at Mercury’s surface, so what is the “darkening agent” there? About a year ago, scientists proposed that Mercury’s darkness was due to carbon that gradually accumulated from the impact of comets that traveled into the inner Solar System. Now scientists, led by Patrick Peplowski of the Johns Hopkins University Applied Physics Laboratory, have used data from the MESSENGER mission* to confirm that a high abundance of carbon is present at Mercury’s surface. However, they also have also found that, rather than being delivered by comets, the carbon most likely originated deep below the surface, in the form of a now-disrupted and buried ancient graphite-rich crust, some of which was later brought to the surface by impact processes after most of Mercury’s current crust had formed. The results are published in the March 7, 2016, Advanced Online Publication of Nature Geoscience. MESSENGER obtained its statistically robust data via many orbits on which the spacecraft passed lower than 60 miles (100 km) above the surface of the planet during its last year of operation. The data used to identify carbon included measurements taken just days before MESSENGER impacted Mercury in April 2015. Repeated Neutron Spectrometer measurements showed higher amounts of low-energy neutrons, a signature consistent with the presence of elevated carbon, coming from the surface when the spacecraft passed over concentrations of the darkest material. Estimating the amount of carbon present required combining the neutron measurements with other MESSENGER datasets, including X-ray measurements and reflectance spectra. 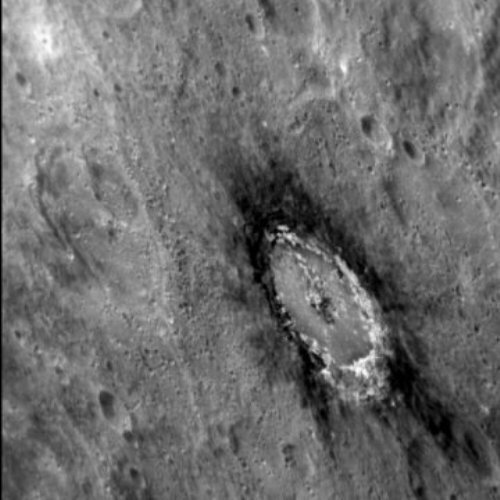 Together, the data indicate that Mercury’s surface rocks are made up of as much as a few weight percent graphitic carbon, much higher than on other planets. Graphite has the best fit to the reflectance spectra, at visible wavelengths, and the likely conditions that produced the material. When Mercury was very young, much of the planet was likely so hot that there was a global “ocean” of molten magma. From laboratory experiments and modeling, scientists have suggested that as this magma ocean cooled, most minerals that solidified would sink. A notable exception is graphite, which would have been buoyant and floated to form the original crust of Mercury. “We’ve taken a major step back in time, beyond what we’d ever expected to be able to do with Hubble. We see GN-z11 at a time when the universe was only three percent of its current age,” explained principal investigator Pascal Oesch of Yale University in New Haven, Connecticut. The team includes scientists from Yale University, the Space Telescope Science Institute (STScI) in Baltimore, Maryland, and the University of California in Santa Cruz, California. This measurement provides strong evidence that some unusual and unexpectedly bright galaxies found earlier in Hubble images are really at extraordinary distances. Previously, the team had estimated GN-z11’s distance by determining its color through imaging with Hubble and NASA’s Spitzer Space Telescope. Now, for the first time for a galaxy at such an extreme distance, the team used Hubble’s Wide Field Camera 3 to precisely measure the distance to GN-z11 spectroscopically by splitting the light into its component colors. 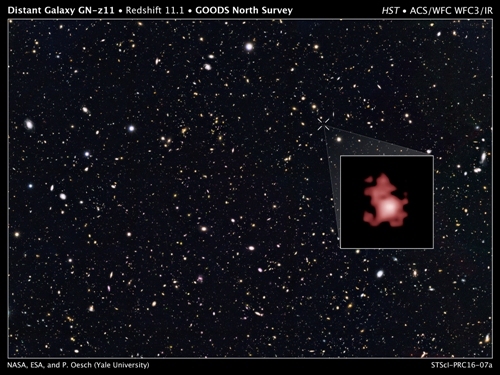 Astronomers measure large distances by determining the “redshift” of a galaxy. This phenomenon is a result of the expansion of the universe; every distant object in the universe appears to be receding from us because its light is stretched to longer, redder wavelengths as it travels through expanding space to reach our telescopes. The greater the redshift, the farther the galaxy. “Our spectroscopic observations reveal the galaxy to be even farther away than we had originally thought, right at the distance limit of what Hubble can observe,” said Gabriel Brammer of STScI, second author of the study. The results reveal surprising new clues about the nature of the very early universe. “It’s amazing that a galaxy so massive existed only 200 million to 300 million years after the very first stars started to form. It takes really fast growth, producing stars at a huge rate, to have formed a galaxy that is a billion solar masses so soon,” explained investigator Garth Illingworth of the University of California, Santa Cruz. These findings provide a tantalizing preview of the observations that the James Webb Space Telescope will perform after it is launched into space in 2018. “Hubble and Spitzer are already reaching into Webb territory,” Oesch said. “This new discovery shows that the Webb telescope will surely find many such young galaxies reaching back to when the first galaxies were forming,” added Illingworth. The team’s findings will appear in the March 8, 2016, edition of The Astrophysical Journal. University of Chicago scientists have discovered evidence in a meteorite that a rare element, curium, was present during the formation of the solar system. This finding ends a 35-year-old debate on the possible presence of curium in the early solar system, and plays a crucial role in reassessing models of stellar evolution and synthesis of elements in stars. Details of the discovery appear in the March 4 edition of Science Advances. “Curium is an elusive element. It is one of the heaviest-known elements, yet it does not occur naturally because all of its isotopes are radioactive and decay rapidly on a geological time scale,” said the study’s lead author, François Tissot, UChicago PhD’15, now a W.O. Crosby Postdoctoral Fellow at the Massachusetts Institute of Technology. And yet Tissot and his co-authors, UChicago’s Nicolas Dauphas and Lawrence Grossman, have found evidence of curium in an unusual ceramic inclusion they called “Curious Marie,” taken from a carbonaceous meteorite. Curium became incorporated into the inclusion when it condensed from the gaseous cloud that formed the sun early in the history of the solar system. Curious Marie and curium are both named after Marie Curie, whose pioneering work laid the foundation of the theory of radioactivity. Curium was only discovered in 1944, by Glenn Seaborg and his collaborators at the University of California, Berkeley, who, by bombarding atoms of plutonium with alpha particles (atoms of helium) synthesized a new, very radioactive element. To chemically, and unambiguously, identify this new element, Seaborg and his collaborators studied the energy of the particles emitted during its decay at the Metallurgical Laboratory at UChicago (which later became Argonne National Laboratory). The isotope they had synthesized was the very unstable curium-242, which decays in a half-life of 162 days. On Earth today, curium exists only when manufactured in laboratories or as a byproduct of nuclear explosions. Curium could have been present, however, early in the history of the solar system, as a product of massive star explosions that happened before the solar system was born. 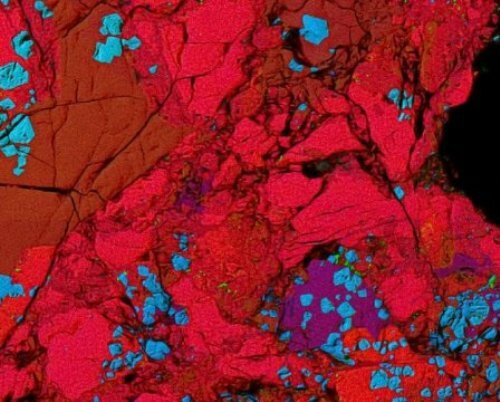 “The possible presence of curium in the early solar system has long been exciting to cosmochemists, because they can often use radioactive elements as chronometers to date the relative ages of meteorites and planets,” said study co-author Nicolas Dauphas, UChicago’s Louis Block Professor in Geophysical Sciences. Indeed, the longest-lived isotope of curium (247Cm) decays over time into an isotope of uranium (235U). Therefore, a mineral or a rock formed early in the solar system, when 247Cm existed, would have incorporated more 247Cm than a similar mineral or rock that formed later, after 247Cm had decayed. If scientists were to analyze these two hypothetical minerals today, they would find that the older mineral contains more 235U (the decay product of 247Cm) than the younger mineral. “The idea is simple enough, yet, for nearly 35 years, scientists have argued about the presence of 247Cm in the early solar system,” Tissot said. Early studies in the 1980s found large excesses of 235U in any meteoritic inclusions they analyzed, and concluded that curium was very abundant when the solar system formed. More refined experiments conducted by James Chen and UChicago alumnus Gerald Wasserburg, SB’51, SM’52, PhD’54, at the California Institute of Technology showed that these early results were spurious, and that if curium was present in the early solar system, its abundance was so low that state-of-the-art instrumentation would be unable to detect it. Scientists had to wait until a new, higher-performance mass spectrometer was developed to successfully identify, in 2010, tiny excesses of 235U that could be the smoking gun for the presence of 247Cm in the early solar system. “That was an important step forward but the problem is, those excesses were so small that other processes could have produced them,” Tissot noted. Models predict that curium, if present, was in low abundance in the early solar system. Therefore, the excess 235U produced by the decay of 247Cm cannot be seen in minerals or inclusions that contain large or even average amounts of natural uranium. One of the challenges was thus to find a mineral or inclusion likely to have incorporated a lot of curium but containing little uranium. Thanks to this sample, the research team was able to calculate the amount of curium present in the early solar system and to compare it to the amount of other heavy radioactive elements such as iodine-129 and plutonium-244. They found that all these isotopes could have been produced together by a single process in stars. “This is particularly important because it indicates that as successive generations of stars die and eject the elements they produced into the galaxy, the heaviest elements are produced together, while previous work had suggested that this was not the case,” Dauphas explained. The finding of naturally occurring curium in meteorites by Tissot and collaborators closes the loop opened 70 years ago by the discovery of man-made Curium and it provides a new constraint, which modelers can now incorporate into complex models of stellar nucleosynthesis and galactic chemical evolution to further understand how elements like gold were made in stars. The surface of the planet Mars tilted by 20 to 25 degrees 3 to 3.5 billion years ago. This was caused by a massive volcanic structure, the Tharsis volcanic dome, which is the largest in the Solar System. Because of its extraordinary mass, it caused the outer layers of Mars (its crust and mantle) to rotate around its core. The discovery of this huge shift changes our vision of Mars during the first billion years of its history, at a time when life may have emerged. 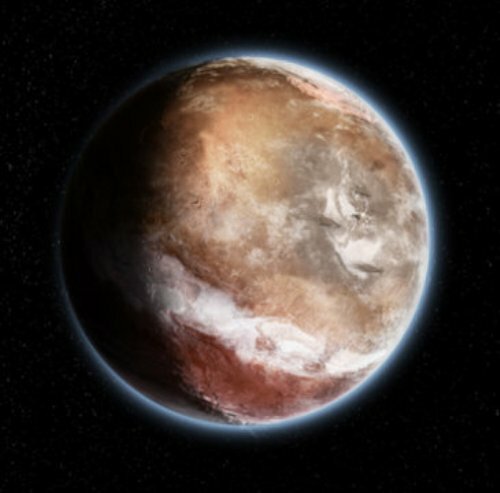 It also provides a solution to three puzzles: we now know why rivers formed where they are observed today; why underground reservoirs of water ice, until now considered anomalous, are located far from the poles of Mars; and why the Tharsis dome is today situated on the equator. These findings are published on 2 March 2016 in the journal Nature by a mainly French team including researchers from Géosciences Paris Sud (CNRS/Université Paris-Sud), Géosciences Environnement Toulouse (CNRS/Université Toulouse III — Paul Sabatier/IRD) and the Laboratoire de Météorologie Dynamique (CNRS/École polytechnique/UPMC/ENS), together with a researcher from the Lunar and Planetary Laboratory (University of Arizona, US). Mars hasn’t always looked like it does today. Some 3 to 3.5 billion years ago, the planet underwent a huge tilt, which has now been identified thanks to the combined work of geomorphologists, geophysicists and climatologists. It wasn’t the rotation axis of Mars that shifted (a process known as variation of obliquity) but rather the outer layers (mantle and crust) that rotated with respect to the inner core, rather like turning the flesh of an apricot around its stone. This phenomenon had been predicted theoretically, but never demonstrated. The tilt was caused by the gigantic Tharsis volcanic dome, which first started to form over 3.7 billion years ago at a latitude of around 20°N. 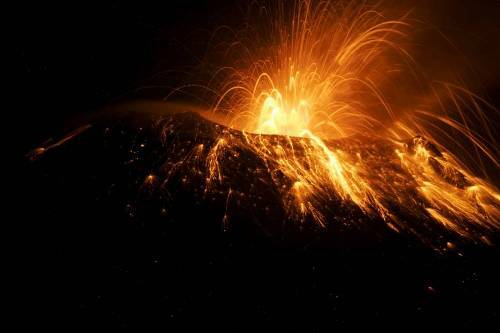 Volcanic activity continued for several hundred million years, forming a plateau exceeding 5,000 km in diameter, with a thickness of about 12 km and a mass of a billion billion tons (1/70th the mass of the Moon). This mass was so huge that it caused Mars’ crust and mantle to swivel around. As a result, the Tharsis dome shifted to the equator, corresponding to its new equilibrium position. So before this tilt, the poles of Mars were not in the same place as they are today. In 2010, Isamu Matsuyama (University of Arizona) had already used a geophysical model to show that, if the Tharsis dome is removed from Mars, the planet takes on a different orientation with respect to its axis. In this new study, geomorphologists Sylvain Bouley (Université Paris-Sud) and David Baratoux (Université Toulouse III — Paul Sabatier) show for the first time that the rivers were originally distributed along a south tropical band on a planet Mars that rotated around poles shifted by about 20 degrees with respect to their current positions. These poles are consistent with those calculated independently by Matsuyama. This remarkable correlation is supported by observations by other scientific teams who had already observed traces of glacier melting and retreat, as well as evidence of subsurface ice, in the former polar regions. Such a shift would have had a significant impact on the appearance of the planet, whose topography in this early configuration was recalculated by Matsuyama with the aim of examining the effects of the relief on primitive Mars. This study radically changes the generally accepted scenario, according to which the Tharsis dome was thought to have mainly formed before 3.7 billion years ago and to have existed before the rivers, since it controlled their flow direction. On the basis of the calculated topography, Bouley, Antoine Séjourné (Université Paris-Sud) and François Costard (CNRS) have shown that despite the different relief, with or without Tharsis, in both cases most rivers would have flowed from the cratered highlands of the southern hemisphere to the low plains of the northern hemisphere. This observation shows that the rivers could have been entirely contemporaneous with the formation of the Tharsis dome. The topography of Mars before the tilt can also be used to study the early climate of the planet. Using climate models at the Laboratoire de Météorologie Dynamique, François Forget (CNRS) and Martin Turbet (UPMC) show that, with a cold climate and an atmosphere denser than it is today, ice accumulated at around latitude 25°S, in regions corresponding to the sources of now dry river beds. Around the Milky Way’s black hole is a donut-shaped structure about eight light-years across that rings the inner volume of neutral gas and thousands of individual stars. Around that, stretching out to about 700 light-years, is a dense zone of activity called the Central Molecular Zone (CMZ). It contains almost eighty percent of all the dense gas in the galaxy – a reservoir of tens of millions of solar masses of material – and hosts giant molecular clouds and massive star forming clusters of luminous stars, among other regions many of which are poorly understood. For example, the CMZ contains many dense molecular clouds that would normally be expected to produce new stars, but which are instead eerily desolate. It also contains gas moving at highly supersonic velocities – hundreds of kilometers per second (hundreds of thousands of miles per hours). CfA astronomers Cara Battersby, Dan Walker, and Qizhou Zhang, with their team of colleagues, used the Australian Mopra radio telescope to study the three molecules HNCO, N2H+, and HNC in the CMZ. These particular molecules were selected because they do a good job of tracing the wide range of conditions thought to be present in the CMZ, from shocked gas to quiescent material, and also because they suffer only minimally from cluttering and extinction effects that complicate more abundant species like carbon monoxide. The scientists developed a new computer code to analyze efficiently the large amounts of data they had. The astronomers find, consistent with previous results, that the CMZ is not centered on the black hole, but (for reasons that are not understood) is offset; they also confirm that the gas motions throughout are supersonic. They identify two large-scale flows across the region, and suggest they represent one coherent (or at most two independent) streams of material, perhaps even spiral-like arms. They also analyze the gas in several previously identified zones of the CMZ, finding that one shell-like region thought to be the result of supernova explosions may instead be several regions that are physically unrelated, and that a giant cloud thought to be independent is actually an extension of the large-scale flows. The scientists note that this work is a first step in unraveling an intrinsically complex galactic environment, and that pending research will trace the gas motions to larger distances and try to model the CMZ gas motions with computer simulations. Scripps Institution of Oceanography, UC San Diego researchers published new findings on the role geological rock formations offshore of Japan played in producing the massive 2011 Tohoku-oki earthquake, one of only two magnitude 9 mega-earthquakes to occur in the last 50 years. The study, published in the journal Nature, offers new information about the hazard potential of large earthquakes at subduction zones, where tectonic plates converge. The magnitude 9 quake, which triggered a major tsunami that caused widespread destruction along the coastline of Japan, including the Fukushima nuclear plant disaster, was atypical in that it created an unusually large seismic movement, or slip, of 50 meters (164 feet) within a relatively small rupture area along the earthquake fault. To better understand what may have caused this large movement, Scripps researchers used gravity and topography data to produce a detailed map of the geological architecture of the seafloor offshore of Japan. The map showed that the median tectonic line, which separates two distinct rock formations, volcanic rocks on one side and metamorphic rocks on the other, extends along the seafloor offshore. The region over the earthquake-generating portion of the plate boundary off Japan is characterized by variations in water depth and steep topographic gradients of about six kilometers (3.7 miles). These gradients, according to the researchers, can hide smaller variations in the topography and gravity fields that may be associated with geological structure changes of the overriding Japan and subducting Pacific plates. “The new method we developed has enabled us to consider how changes in the composition of Japan’s seafloor crust along the plate-boundary influences the earthquake cycle,” said Dan Bassett, a postdoctoral researcher at Scripps and lead author of the study. The researchers suggest that a large amount of stress built up along the north, volcanic rock side of the median tectonic line resulting in the earthquake’s large movement. The plates on the south side of the line do not build up as much stress, and large earthquakes have not occurred there.